After thousands of miles hiking, cycling and paddling on three continents in very different climate zones and seasons I realised that my gear requirements are very different than most other hikers'. Most hikers stay within one climate zone and/or season and can customize their gear towards this specific requirement. As a result they can lighten their load tremendously because the range of application is very narrow. You carry more versatile gear - and accept the weight penalty in order to avoid logistical hassle. Or in other words: You have to find a good balance between being as light as possible but also having the adequate gear for very different situations. In reality my hiking style has become a mix of the two approaches. Although I try to cover as many situations as possible with my gear, I still buy new equipment along the way or even have it shipped to me occasionally. But still my gear thoughts are geared towards long distance hikers long traversing different climate zones and/or seasons who do not want (completely) to rely on the logistical approach. So what sort of gear do I use now? I will try to describe the kind of gear I use and give brand examples for it. That does not mean that the specific brand I use is the very best or only one available - it is just meant to be an example. Tent: My tent is my home for months on end and my only refuge in foul weather. I have come to the conclusion that I am willing to accept a slight weight penalty in order to have a hassle free, reliable and comfortable shelter. Any compromise on these topics has a psychological impact on the enjoyment of a long hike. I want to be sure that - no matter what - in the evening I will be in a nice and safe environment where I can relax and don't have to worry about bugs, wind and rain. Therefore I have stopped using tarps. Although they are great for certain environments my long hikes will almost certainly get me to areas where a tarp is not the optimal solution. I do not want to deal with extra bug nets in mosquito country - I want a fully enclosed tent. Stealth camping in heavily populated areas like Europe I want a tent that has a camouflage color like green or brown and that provides protection from curious views. Whoever spots my tent should not be able to see from outside who is sleeping inside. Hiking the PCT and CDT I was very happy with a non-freestanding tent. I was almost always camping in wooded areas with forest as wind protection and good ground to stake the tent down. This type of tent showed its limitations when I hiked the Florida Trail and the Arizona Trail. The swampy ground in Florida was too soft to hold stakes in heavy rain and my tent collapsed regularly on me. In Arizona I had the opposite problem: The desert ground was often too hard to get the stakes in far enough and the strong winds pulled them out. Hiking in Europe I encountered a new challenge: Very often I came across open shelters that I wanted to use for wind and rain protection. But in order to avoid sleeping on dirty ground or being bitten by mosquitoes I wanted to set up my tent inside the shelter. Unfortunately this is very difficult or almost impossible with a non-freestanding tent. All those reasons made me change to a freestanding tent. Still, despite all these requirements I want a light weight tent and this can be achieved with a single wall tent that uses trekking poles. Oh, and this being my home for months it has to be comfortable, i.e roomy enough so that I can sit out a day of bad weather in it without getting crazy. To sum it up: My shelter must be fully enclosed, freestanding, windstable, in a camouflage color, roomy, single wall and lightweight, preferably using trekking poles. A tent that fulfills all these requirements and works very well for me is a Tarptent Rainbow. Sleeping bag: Like almost all my fellow thruhikers I started my hiking career on the PCT with a Western mountaineering down sleeping bag which worked very well in the Western USA. Over the years I expanded and bought more and more WM bags for warmer and colder conditions still believing in the UL mantra that down is always better because it is lighter than synthetic. But once I started hiking outside the relatively dry Western US I quickly learned about the disadvantages of down. In damp conditions down clumps and loses its warming abilities. Long term use adds to the problem as body oils also make the feathers clump. Despite washing the bags with down soap the problem persisted. I found down to become very unreliable. Any foggy night or wet tent wall would deteriorate its warming abilities and I never knew when I would be able to dry the bag again. It took me a long time but after several years of frustration with down I started using synthetic. The big downside of synthetic is its higher weight. But I could compensate it by changing from a full sleeping bag to a quilt. This was a big step and I was very nervous how my new setup would work out. I first tried it on a hike across the UK where the climate is so damp that I knew I would almost certainly encounter problems with down. The new synthetic quilt worked out so well that I have never used a down bag again. Synthetic is so much more reliable than down. No matter how much you abuse it, it will still keep you warm. Touching wet tent walls, condensating breath and foggy nights were not a problem any more. Even if I could not air the quilt for several days or even a couple of weeks, it still kept me warm. I also could not see that the synthetic insulation was deteriorating from being compressed every day. And now I honestly wonder why synthetic is not more popular. A synthetic quilt has definitely become my default sleeping system. I use Enlightened Equipment Prodigy quilts. Sleeping pad: Whereas I have found the perfect tent and quilt for me I have not found the perfect sleeping pad but only the best compromise available. Close cell foam pads are great because they are cheap, reliable and relatively lightweight. But they have two downsides: They are not very comfortable. This does not really matter very much on short trips, but sleeping on it for months on end I want a bit more comfort. Even more important, cell foam pads are too bulky. I find it hard to fit a foam pad into my pack and always have to strap it onto it. Not very practical, especially when you have to bushwhack or crawl under obstacles. The pad is always in the way. So I moved one step up towards being more comfortable and started using Thermarest Prolite pads. A short one for 3 season use and a regular length Prolite Plus for fall and winter. So far I have not found a better solution although the TAR Prolite series (or any other similar inflatable pad) comes with one built in defect: After about 6 months of constant use it will start delaminating. Luckily this is covered under TAR's life time warranty and this is also the only reason why I stick with TAR. The delaminted pads are usually exchanged without much hassle and there are TAR dealers worldwide. Despite the fact that I don't even use a groundsheet underneath my tent I have never had a puncture in a TAR Prolite in all my hiking career. Several years after the NeoAir series had come out I was finally lured into buying one myself, a NeoAir All Season. After only a couple of weeks of use I got my first puncture which was very difficult to detect and repair in winter conditions. This frustrating experience made me skeptical of NeoAirs. I steill use a NeoAir All Season on European hikes where I am close to civilisation and can bail out in case of a failure but I always carry a thick extra ground sheet for protection. On more remote hikes a robust inflatable pad like a TAR Prolite is, although far from being perfect, the best compromise between weight, bulk, comfort, price and durability. Backpack: In order to be able to cope with long stretches without resupply possibilities I want a backpack with a rather large volume and the ability to carry food for over a week which means a volume of at least 65 litres or 4,000 cuin. The Gossamer Gear G4 meets this requirement and also features mesh pockets which turned out to be invaluable. Stuff in these mesh pockets is easily accesible which is very useful for snacks or maps. You can use the mesh pockets for drying wet or damp clothes. And you can use them to stow your water bladders. This way you can balance the heavy water load much better, you have easy access to your water containers and you won't get your clothes or other gear wet if one of your water containers leaks. Backpacks made out of Silnylon or any other lightweight material only have a limited life expectancy due to the fragility of the fabric. I usually get at least one year of constant use out of them but still price becomes important for an item that is almost a consumable. I therefore would not buy a very high end backpack like the German Laufbursche or HMG cuben packs. I am looking for backpacks that have a volume of at least 4,000 cuin or 65 litres, feature mesh pockets and a hip belt and are priced under 200$ like the Gossamer Gear G4. Cooking system: I started out with an alcohol stove but quickly realised that this is not for me. The longer I hike the more I want a quick and reliable stove. Handling an alcohol/Heet stove turned out to be too complicated and fiddly in windy and cold conditions. I wanted an easier and foolproof solution and turned to a lightweight gas canister stove. I have to admit that alcohol/Heet is more widely available than gas canisters but I have always been able to find them in Western countries. I studied charts comparing the efficiency of different fuel types and that confirmed my assumption that gas canisters win over alcohol for longer stretches without resupply. As I am normally cooking lunch and dinner this is an important factor for me. Still, it very much depends on your personal preference what kind of stove you use on a very long hike and I can see that alcohol stoves might work for other people. My personal preference is a lightweight gas canister stove with a piezo igniter like the Snowpeak Titanium Gigapower. I have used a MSR Pocket Rocket before but was very much disappointed with it because the thread wore out after about half a year. I use a 1 litre pot which has to serve various purposes. I want a flat pot rather than a high cup because I can use it for washing stuff and small items of clothes in it. I can even use it to wash myself. And I can fit a medium size gas canister in it. I find it easier to have put with handles than a seperate pot gripper. Titianium has turned out to be the ideal, albeit expensive material - but it has been worth it. I have been continuously using my titanium pot for 5 years. If I had to replace it would buy another 1 litre flat titanium pot with handles. Rain gear: I have been experimenting with different types of rain gear like umbrellas, ponchos and rain jackets and pants. Although umbrellas and ponchos are ideal for certain conditions they are no allrounders. For my purposes a rain jacket and pants are the most versatile combination. Umbrellas and ponchos have disadvantages in certain conditions: You don't have your hands free using an umbrella. Your backpack is difficult to access under a poncho - and you can trip over it. Both are very difficult to use in windy conditions. Rain jackets and pants can also be used as a wind breaker. I have used all types of fabric from Goretex Paclite and Event to Tyvek. In my experience they are not very different on the long run. No fabric will keep you completely dry in extended periods of heavy rain. An expensive eVent jacket won't perform much better than a cheap Tyvek rain suit. Both have their issues and will break rather quickly after long term use. Therefore I just go for the cheapest solution: a Tyvek type rain suit like Frogg Toggs and O2 rain shield. Although these materials are the most delicate at least they are cheap. I don't mind replacing a cheap Tyvek rain jacket every year or even every 6 months, but I don't want to buy a new expensive Goretex Paclite or eVent jacket every year. Water purification: Trying to be as light as possible rules out a water filter - too heavy and too bulky. A Steripen relies on batteries which can easily fail and run out. Too risky for long trips. A Sawyer Squeeze is only good if you can be sure you won't encounter freezing as the filter system will be destroyed by frost. Boiling water uses too much fuel. That leaves only chemical treatment like Aquamira. It is lightweight, compact, reliable and "freeze-thaw" stable. Another option are chlorine tablets like Micropur that have the same advantages but leave a stronger aftertaste. Aquamira bottles can leak when the container gets crushed. For that (unlikely) event I carry some Micropur tablets as a backup for Aquamira. wie schon mein "VorSchreiber" schreibt - wirklich ein sehr interessanter Blog! Den Sawyer Mini hatte ich auch auf dem Wonderland Trail im Gebrauch, die "Tüten" die mitgeliefert werden sind aber nicht sonderlich haltbar! Für einen Trip aller PCT braucht man eSawyer Mini Ersatzbeutel oder Alternativen. Ansonsten danke für den Tipp mit dem tarptent Rainbow, dass werde ich wohl ich aufgrund deiner Empfehlung anschaffen. Good advice on the sleeping system, the down bags are not for every situation. The rainbows seem very popular, I'm currently waiting for a Moment DW to arrive, I've been using a Scarp1 but at 1500 grams, I needed to reduce weight. Surprised you had such problems with down sleeping bags. You must have been unlucky. I live in the UK and always use down bags and have never experienced any problems (I sleep out about 200 nights a year and have done so for fifteen years). I think down products need more careful management. 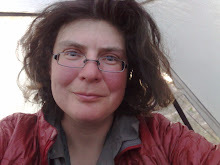 I don't see why a down bag in a tent should get damp, and as for body oils, I always use a silk liner or sleep in my clothes and wear a hat or balaclava to minimise body oils. I use three bags, manly a WM Highlife or Rab 400, or for really cold snow/winter a Joutsen bag. All are down and fab! For the long distance hikers who spends their journey across different climates and cultures, its very much important to planning up about the gears they will carry before they start for new hiking. Exchanging and trading gear when it is no longer used is a good idea to minimize the cost and it helps to buy new gear for new location. Great trips you did. Can only dream off! THX for the suggestions, and hints. And the best are your explained reasons why you choose what. Many thru-hiking authors seem to get sponsored. It looks at least like you don't. Is it freedom decision? Kirstin, I have checked as well and it seems like Gossamer Gear has discontinued its G4 backpack. We have phased them out and have plans to bring them back redesigned in 2018. Thank you and have a great winter! Thanks an big compliments on your most helpful blog, real-life- & experience-based recommendations! Helped me saving some carry-on weight with my equipment. Will think of you when thirsty! I was wondering if you have tried the LifeStraw for water filtration. Do you have any thoughts on the system? Hey Kristin, I am a very amateur hiker/ camper and had a few questions. Do you ever use Hammocks? I have noticed a rising trend in people using hammocks for camping and leisure, is this option pretty terrible in reality for long trips or is it just personal preference. I suppose that with a hammock you also need a tarp which I guess could defeat the purpose of the lightweight, quick solution. Second Question, Do you always put your rain fly up, even if youre pretty sure its not going to rain? In deiner aktuell veröffentlichten Packliste steht eine 7,50 EUR Regenjacke mit einer Wassersäule von 2000.
würdest du aus deiner Erfahrung sagen, es lohnt nicht beim Kauf einer Regenjacke auf eine höhere Wassersäule zu achten? Lieben Dank für die Infos. This is the best article I have ever read about outdoor hiking, and thank you for sharing such detailed and interesting information.